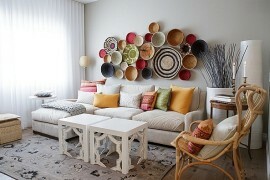 The customs, traditions and decorating style of Morocco have a storied and diverse past. For those who have missed it, we have already explored this unique heritage of the North African nation when we showcased some stunning living rooms with a distinct Moroccan flavor. 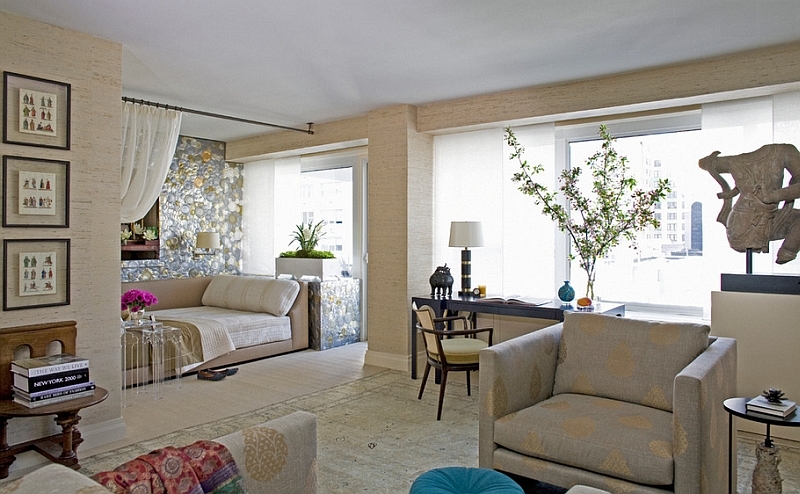 Today we move beyond the living area and into the private sanctuary that is the bedroom. 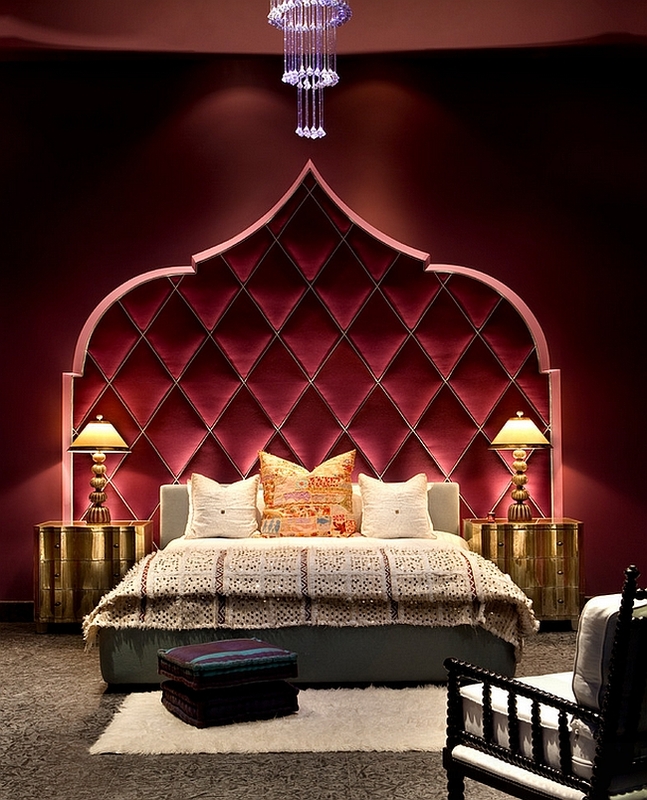 Thanks to the rich diversity of the Moroccan design style, a modern bedroom inspired by a Moroccan theme can balance both contemporary flair and colorful accents in a hip, elegant fashion. 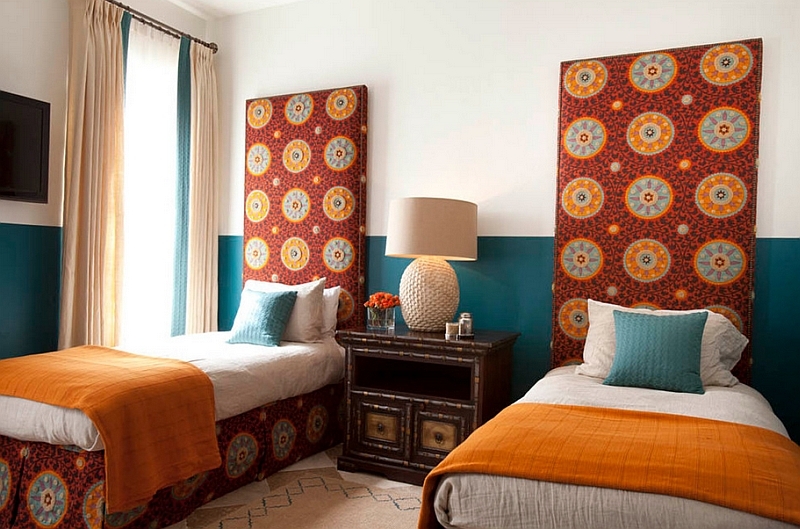 With exotic patterns, amazing hues and a sense of adventure, Moroccan-inspired bedrooms transform your space into a world of visual brilliance and luxury. 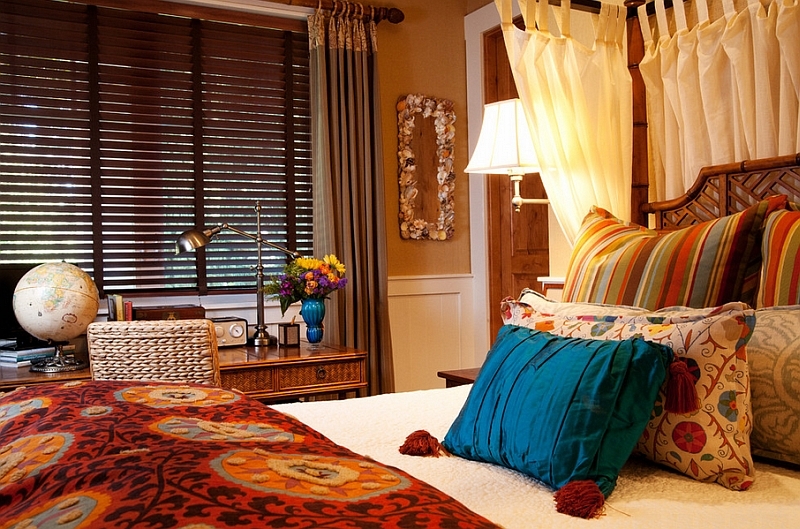 ‘Exciting’ is how you describe a typical bedroom with distinct Moroccan decor additions. 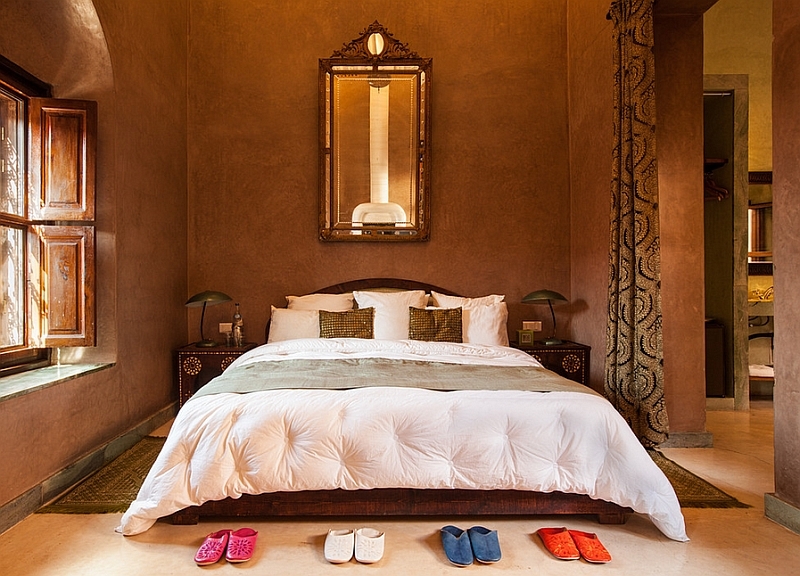 From the audacious and the extravagant to the understated and modern, here is a beautiful collection of Moroccan bedrooms that offer a bit of something for everyone. 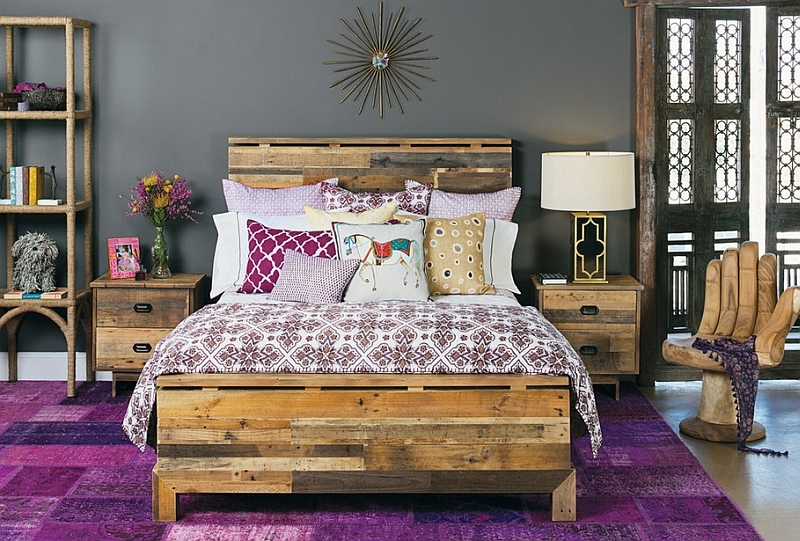 Purple and violet are two colors that have consistently been a part of the hottest color trends for the last decade. Regardless of the shade and hue they come in, they always bring a dash of sophistication and plenty of style! Add to this gold, which is taking over as the most popular metallic accent in 2014, and you have a combination that is truly majestic. 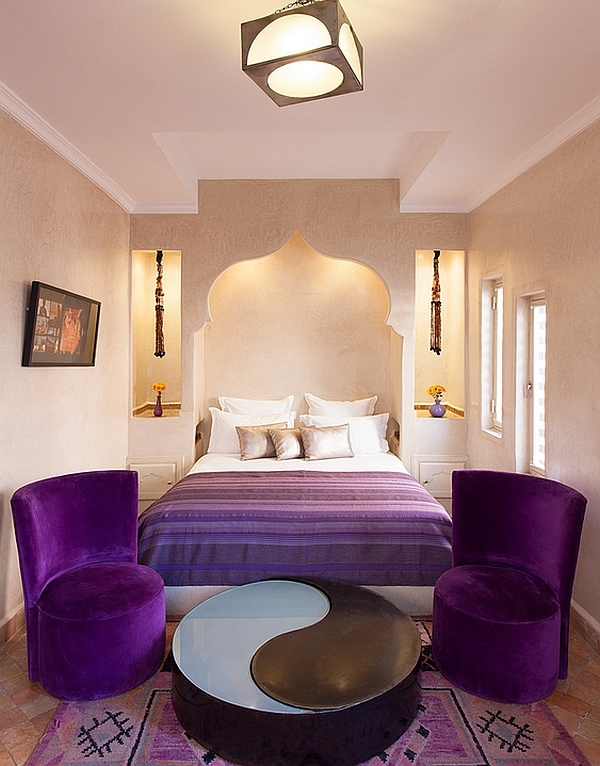 Moroccan bedrooms in purple seem natural, exotic and laced with plenty of opulence. Throw in a few golden accents here and there to create a room that is truly befitting a king or queen from the Middle East! 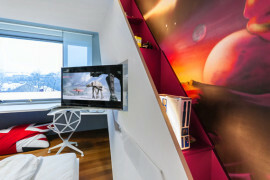 Want to transform your bedroom into a dreamy, romantic hub? 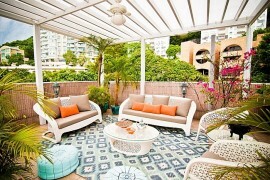 It is hard to find themes that accomplish this with more brightness and splendor than the Moroccan. Ravishing reds and sumptuous scarlets are an integral part of the multi-hued Moroccan decorating style, and combining this with plush velvet textures ensures that you have a truly amazing bedroom. 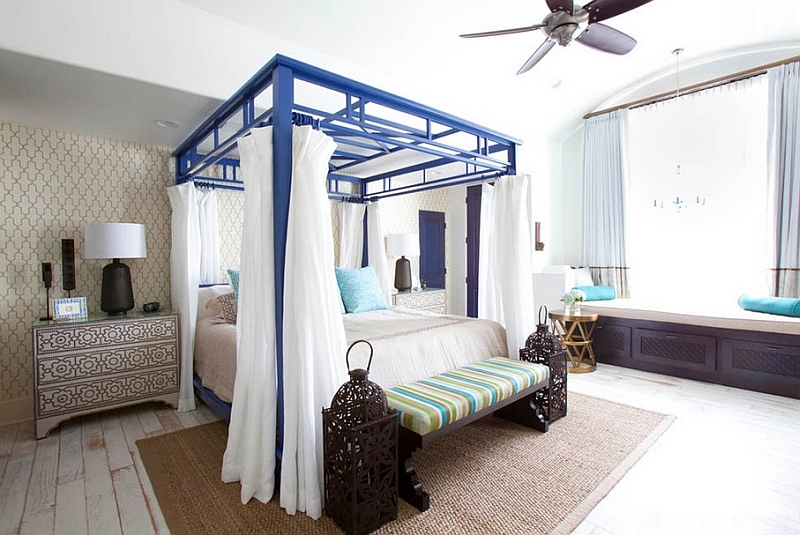 The four-poster bed with a matching canopy adds to the mystical appeal of these bedrooms, while tufted walls make them even more magnificent. 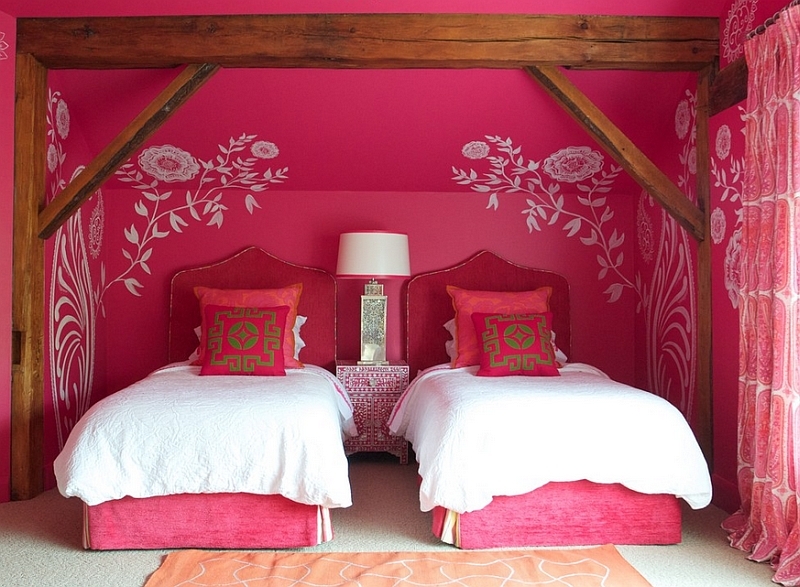 If you are not very happy with absolute reds, then pretty pinks and bold oranges can also bring in the Moroccan vibe without seeming a touch too overwhelming. 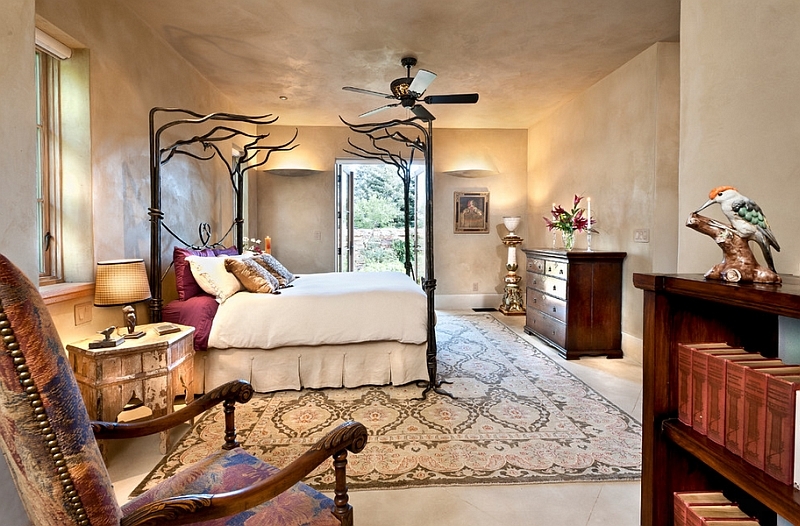 Another tip to decorate your bedroom with Moroccan inspiration without completely committing to the theme is to adopt a more Mediterranean approach. 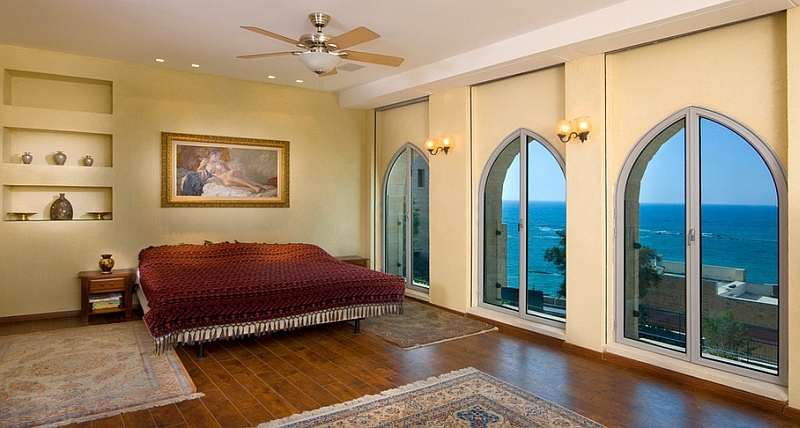 Mediterranean bedrooms often have a more relaxed ambiance and tend to be far less ornate. 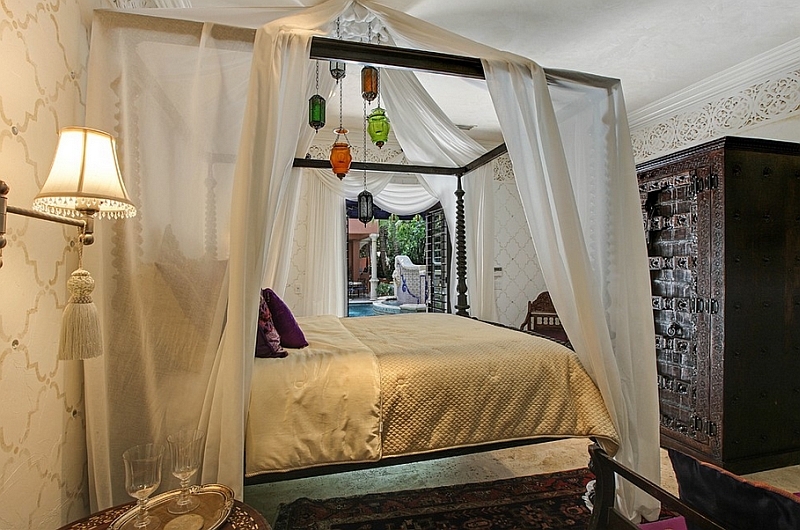 But both the Moroccan culture and design style have a deep connection with the Middle Eastern and Arabic cultures, allowing you to blend it with Mediterranean touches in an effortless and elegant manner. 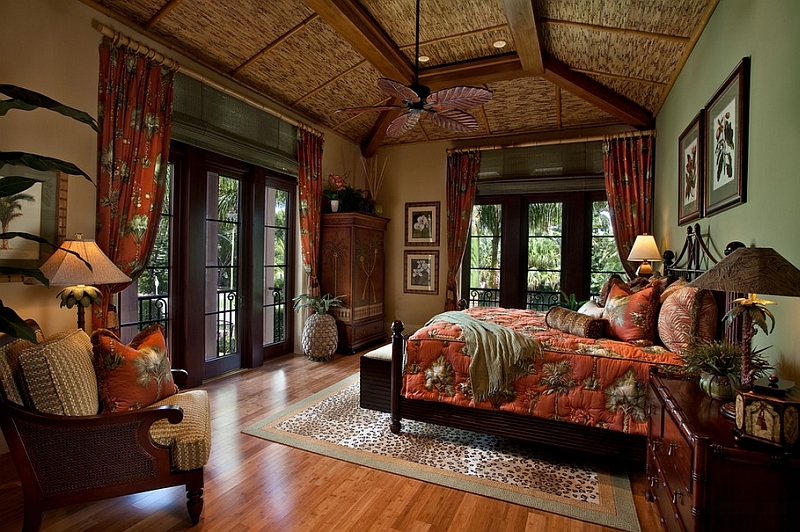 Lovely lantern-style lighting, Mashrabiya panels and distinct windows allow you to blend both styles with ease. 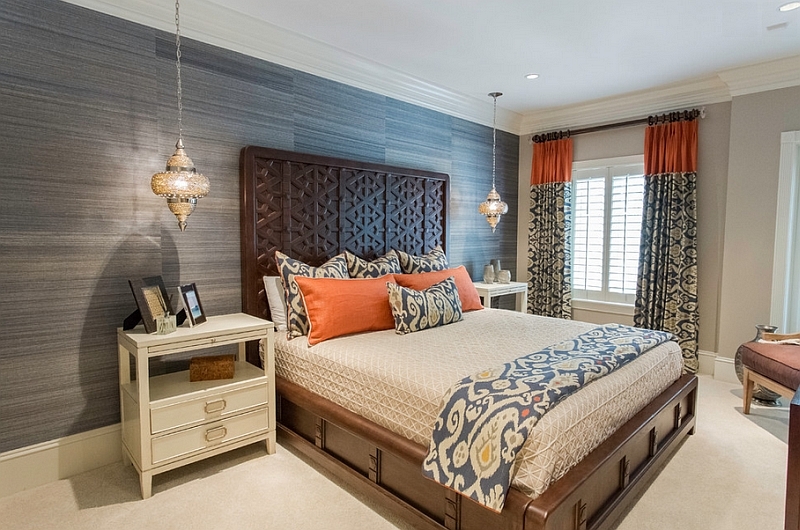 This approach also lets you pick a more neutral backdrop for the bedroom and decor with fewer intricate patterns. 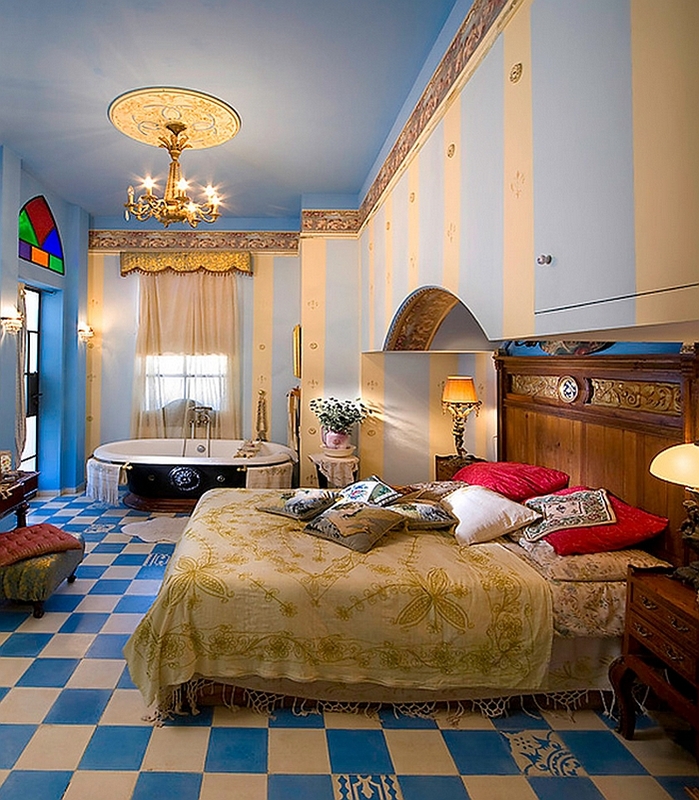 The first thing that comes to mind when we talk about Moroccan-style bedrooms is ornate settings that seem like pages from an ‘Arabian Nights’ story or Disney’s version of Aladdin! 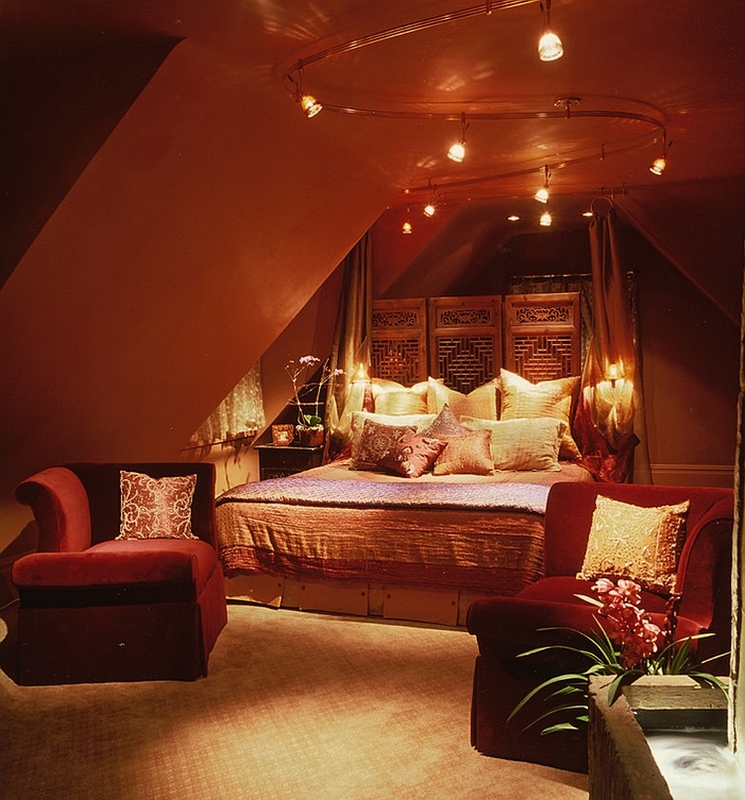 While crafting such a space is very much possible (as you have seen above), most tend to prefer bedrooms that are a touch more practical and far less exotic. The modern Moroccan style is a perfect balance between a backdrop that is contemporary and decor and fabric additions that have a Moroccan zest. 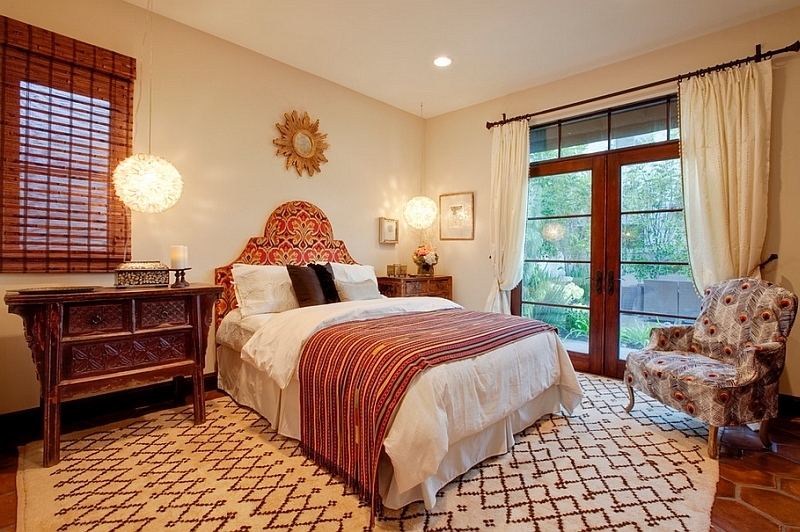 Once again, lantern-style lighting is a key addition here that defines and accentuates this look, while the famous Moroccan rugs, colorful ottomans and geometric patterns complete the style. 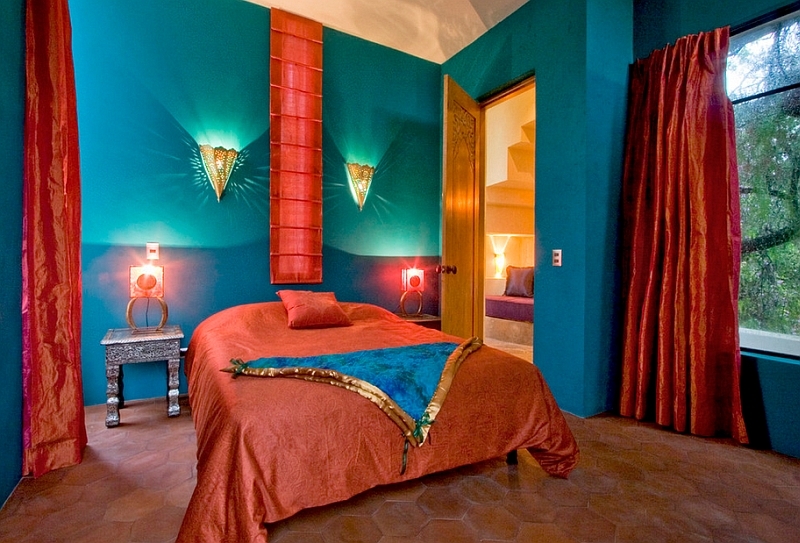 You can blend several different design styles with Moroccan bedroom decor to create a unique, eclectic bedroom that has a style of its own. 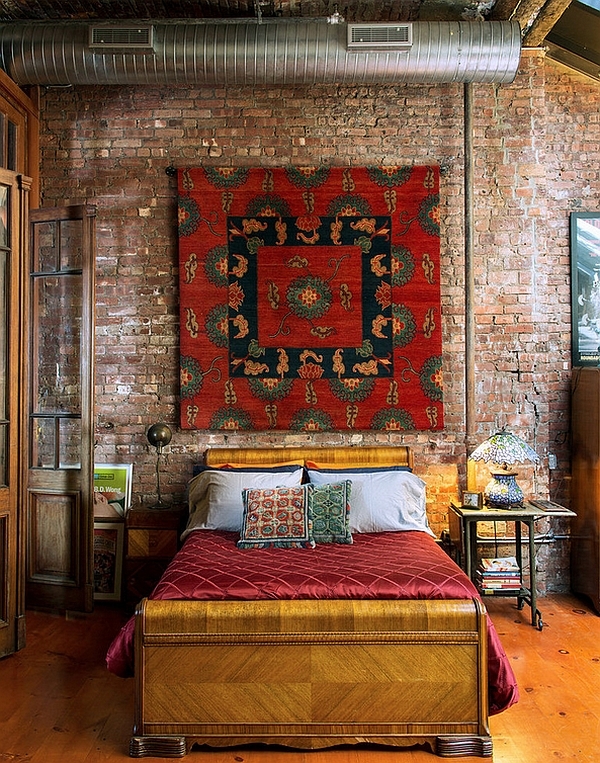 The powerful colors and audacious patterns of Moroccan decor seem tailor-made for a Bohemian-style bedroom that thrives on ordered chaos. 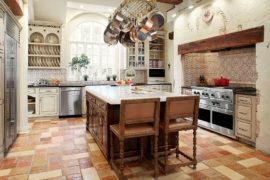 The opposite of this is to add a few mirrored surfaces and take out the daring colors to blend the Moroccan theme with chic Hollywood Regency. 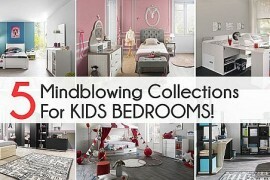 All you need is a bit of imagination to find a style that fits your bedroom best! 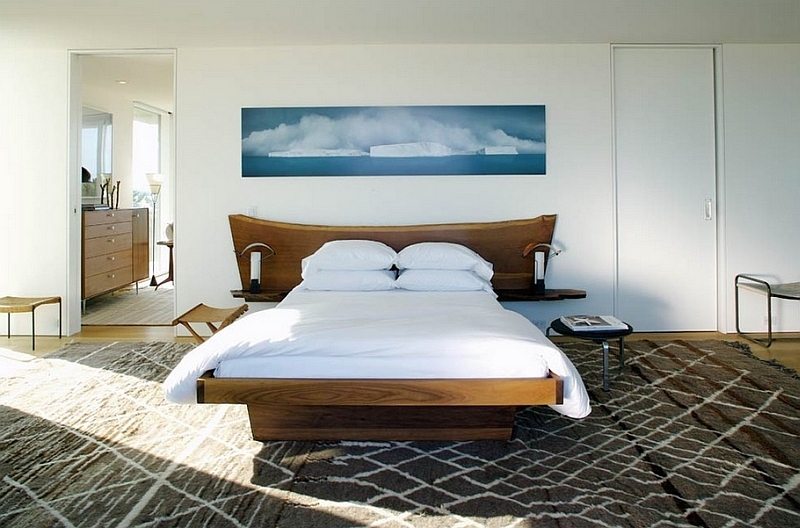 When it comes to bedroom design, a lot of us forget that at the end of the day, it is indeed all about the bed. 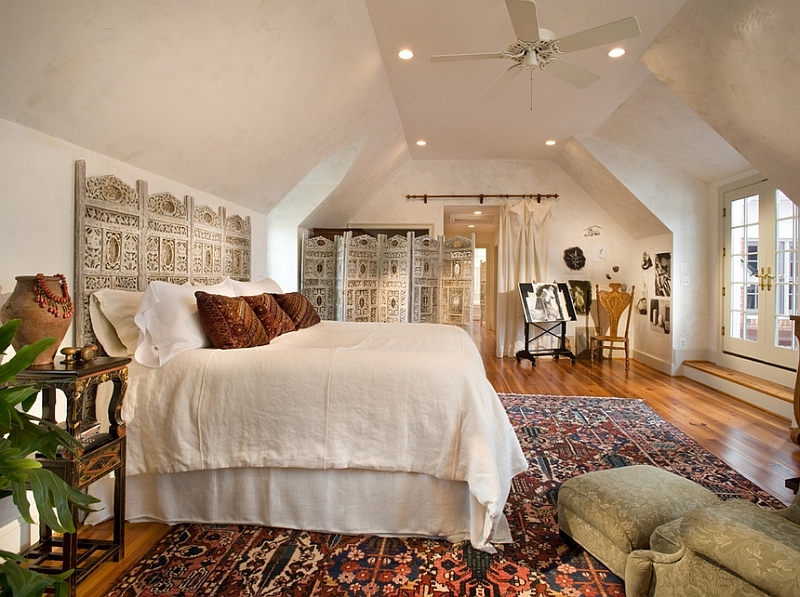 The simplest way to decorate a Moroccan-inspired bedroom (or a bedroom with any theme) is to turn the bed into the defining feature of the room and its unmistakable focal point. 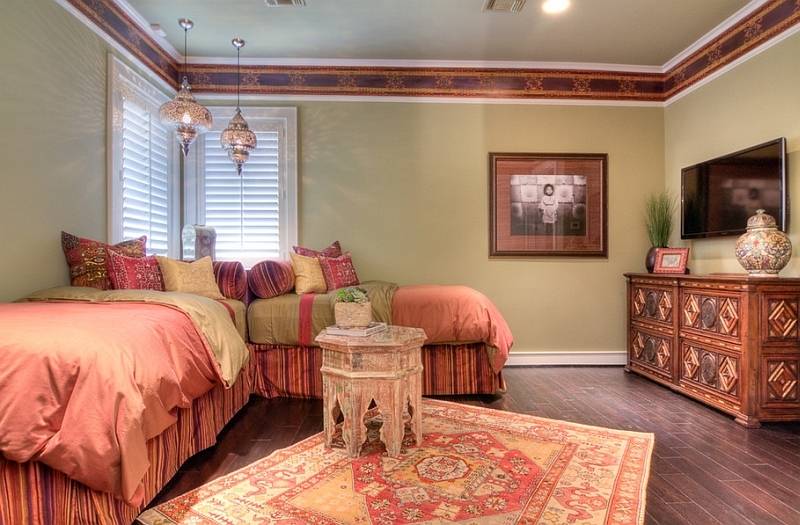 The architectural details and ornate furniture of Moroccan style make this task even simpler. Apart from the canopy bed, you can add elaborate headboards and the right accent lighting to turn your bed into a comfy showstopper. 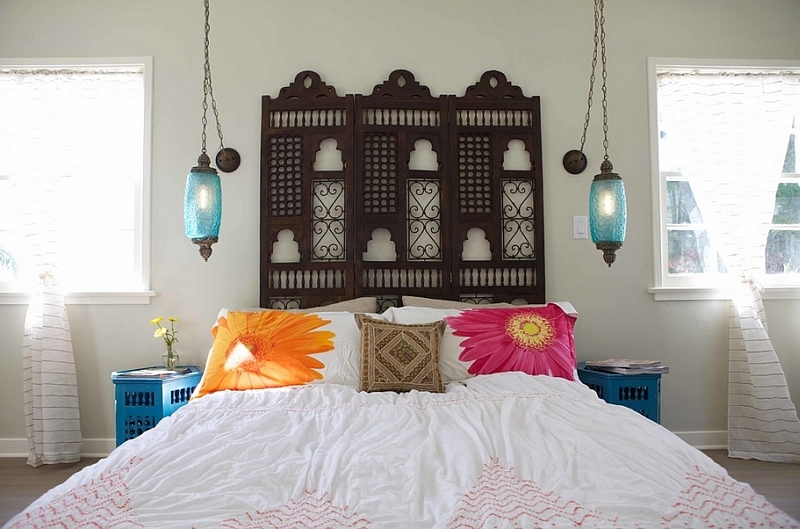 Moroccan decor additions and accessories are easy to find, and its unique lighting style adds to the overall appeal of a bedroom with any style. 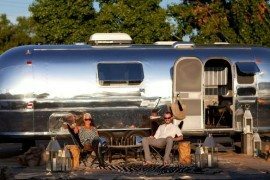 Start out with a few of these additions, and soon you will be lost in this vibrant and beautiful world!